Today I want to talk about skincare routines. I’ve mentioned before that making the switch to an ingredients-conscious, K Beauty-heavy skincare routine has completely transformed my skin. So, this post is about products I’ve added to my nightly rotation that have upped the effectiveness of my nighttime routine. If daytime skincare is all about protection, then nighttime is all about hydration and glow! I love pampering my skin at night, and waking up to a dewy glow that lasts all day. Here are some products that I’ve come to love and depend on for that glowing, dewy skin. Note: If you’ve been following me for a while, then you’d know how much I adore and love the Su:m37 Skin Saver Melting Balm. That was the product that turned me on to K Beauty, because of how much it transformed my skin. I was devastated when it was discontinued! And I had to be the bearer of bad news to many of you guys who were interested in buying it. Today I’m making it up to all of you — in the form of introducing my new HG oil cleanser, the Sulwhasoo Gentle Cleansing Oil EX. Why you need this: Glowing skin starts with a clean canvas, and there’s nothing that cleans your skin like a great cleansing oil. What it is: This gentle cleansing oil features the key ingredients of Coix Lacryma-Jobi seed, tangerine peel extract, and apricot kernel oil, which clear the skin and leave a brighter and healthier base. Performance: YES. This is an incredible lightweight oil that you can hygienically pump out of a sturdy plastic bottle. Goes on smoothly and delicately, and emulsifies beautifully. It removes makeup really quickly and leaves my skin feeling refreshed and smooth. Fragrance: This smells like hanbang heaven, as many Sulwhasoo products do. With a hint of citrus. Where to buy: I usually get my Sulwhasoo products at Tangs (because I’m a member there). Can also be found on Shopee for as low as $40, which is a great price! Why you need this/ What this is: A low-pH, luxurious, crazy thick pillowy foam cleanser that smells like heaven. ‘Nuff said. Performance: If you think that a cleanser is a cleanser is a cleanser (and nothing more), wait til you get your hands on this. The cream comes out like white silk, and becomes luxurious crazy foam. It’s mild, so it’s good for sensitive skin, it’s got a pH of 5, which is the perfect acidity level for your skin, and let’s face it. Skincare is quite psychological, and who doesn’t love using a cleanser that feels incredible? Lastly, you need this because it has the most incredible brightening effect out of any cleanser I’ve ever used. After I wash my face, I’m always amazed at how my pores seem smaller, my skin looks 2 tones lighter, and my skin just feels so fresh. Fragrance: This is another huge plus for me. Probably my favourite scent out of all Sulwhasoo products, this smells, in Snow White & the Asian Pear’s words, ‘like a forest is trying to hump your face’. Yup, it’s absolute pine heaven. Where to buy: Sulwhasoo counters and Shopee. Glow rating: 5/5 glowing, HG stars. I don’t know if this will sound sad, but I’m just going to go ahead and say it — this cleanser makes me look forward to washing my face. I don’t think I’ll be tempted to try another foam cleanser anytime soon, because I’m just so happy with this one. Why you need this: I’ve raved about this before. And we all know: sloughing off dead skin cells + the power of vitamin c = beautiful glowing skin. 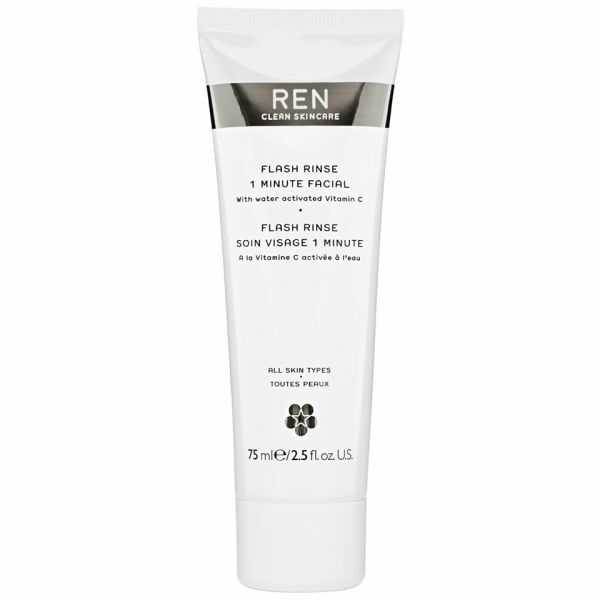 REN is also a skincare brand that is clean and has a beautiful no-poo ingredients list. I wouldn’t go so far as to call them ‘organic’, but I really trust their formulas. What it is: The transforming treatment instantly revitalises and rejuvenates the skin so you can boast a radiant and glowing complexion. The 1 minute facial has been formulated with potent water-activated Vitamin C that works to leave skin firm, toned and smoothed. Performance: Boy does it ever perform. The results of this lasts me about 3 days, and then it’s time to break it out again. How to use: Spread evenly on skin (it has a sandy grainy effect). Wet fingertips and massage gently onto face to activate the magic of Vitamin C. Leave on for 1 minute and rinse off. I use this every 3-4 days, and I skip my acid exfoliant on days that I do. On ‘off’ nights, I use my trusty P50 toner to maintain my acid exfoliation. Fragrance: For those of you familiar with Vitamin C, you will know how funky certain Vitamin C-rich products can smell. This is only good news to me though, because it tells me that the Vitamin C is potent in the product. This one kind of smells like petroleum right out of the tube. Don’t worry, there’s zero petroleum in the formula. After using this, your face and hands will smell strongly of L-Ascorbic acid. I love this. Every time I catch a whiff of the Vitamin C smell long after using this, my satisfaction increases. There is potent Vitamin C in this guys! Where to buy: Sephora.com, Sephora stores, Escentials, and lookfantastic.com. What it is*: The Whamisa Organic Flowers Deep Rich Essence Toner is a liquid concentrate infused with organic botanical extracts for a quick boost of hydration and nourishment. For all skin types, from dry skin to oily skin. A clear favourite in Korean skin care. *Description taken from Glow Recipe. Why you need this: This deep moisturising, beautifully-packaged Whamisa toner is one of the biggest cult products of the year. And I think it’s one of the rare cult products out there that deserve its status. Performance: I like a lot of extra pampering at night, so this toner is perfect. It’s thick, hydrating, and soothing, and a perfect way to prep my skin for my serums and moisturisers. For people with oily skin, I would even go as far as to say that 2-3 layers of this would be an ideal daytime moisturiser. Fragrance: This smells like a cross between fresh cut grass and very delicately-scented flowers. Very clean, and not artificial at all. What it is: A niacinamide and Pitera- heavy serum that reduces PIH and spots, and works to brighten skin. Why you need this: If you don’t mind the splurge and are looking for something that has an instant brightening effect, this serum is a great choice. It’s a milky serum with a slight iridescent sheen that really brightens your skin and gives you a glow. Performance: I can’t deny the brightening effect of this. Like I said above, it’s instant, and you really do wake up the next day with dewy, glowing skin. Fragrance: Smells exactly like the rest of the Genoptics range, which is a slightly powdery, high-end smell. For those of you who can’t stand the smell of SKII’s notoriously stinky Facial Treatment Essence (more popularly known as FTE), don’t worry — this smells nothing like it. I usually alternate this with my beloved and trusty Shark Sauce, which is also high in niacinamide, and has really helped to reduce the PIH and spots on my face. Glow rating: 4/5. I docked 0.5 points off for its price point, which is really steep @ $199. Glow tip: If you’re looking for something else that is brightening, skin strengthening, and will reduce the spots on your face, then check out Shark Sauce. Chel (who is the cook of this magical stuff) comes up with different limited edition Sharks every month. Some of my favourites so far: Hanbang Shark and Lemon Shark. I just got myself a bottle of her Spooky Shark, which contains Tumeric, Donkey Milk, and Pumpkin! Why you need this: When it comes to facial oils, I can’t not go organic and natural. Facial oils are a godsend for dry/ sensitive skin, or any skin that needs relief from daytime stress and pollutants (in other words, all our skin). I love this Mad Hippie Facial Oil for its adorable packaging, but more importantly, for this impressive ingredients list that features argan oil, sea buckthorn berry, blueberry extract, goji berry, and many more other goodies that moisturise and protect your skin. Performance: This oil is so lightweight that I use 1-2 drops of it in my daytime moisturiser, and 3-4 drops on my face at night. With so many antioxidant ingredients, this oil helps to heal, protect, and moisturise my skin, for a lovely lit-from-within glow. Glow rating: 4/5. A great starter oil for anyone who is looking for some extra hydration and glow! What it is*: The KLAIRS Freshly Juiced Vitamin E Mask is incorporated with vitamin E, which is well known as an excellent antioxidant. Did you know that Vitamin E is the ultimate skin care booster that not only delivers an excellent antioxidant power, but also has various effects in benefiting dry, sensitive, and aging skin? Feel the ultimate effect of vitamin E for yourself! Why you need it: If you’re a Vitamin C junkie like myself, you should know that the perfect complement to Vitamin C is… none other than Vitamin E. Skin is even brighter, more even, and more protected with this power combination. Performance: When I saw that a Vitamin E mask had hit the market, I thought it was brilliant. I pounced on it. I was not disappointed. First of all, the product is adorable. It looks like pure white almond jelly. I advise using a plastic scoop to scoop the product out, as it has the springy yet soft consistency of pudding (more specifically, to those of you who are familiar with it, the laoban soya bean pudding). Once on my skin, this mask felt incredibly soothing. My skin just lapped it up. Next day, really dewy, glowing skin. I love it! How to use: In place of your last skincare step (whether it is your sleeping mask or nighttime cream). Where to buy: I got mine on Shoppee for ~$32. Glow rating: 4.5/5. I love this new innovative product! For people with more sensitive skin, use this as a sleeping mask 2-3 times a week, because it doesn’t contain any heavy silicones. Watch out friends. You guys are getting this for Xmas. Phew. And that’s my nighttime routine for glowing skin done! I know some of you balk at the thought of putting 5 or more products on your face everyday, but I promise you it’s worth it. Also, skincare is definitely a customisable process, so play around and find out what works for you! These are just some of my favourite products for ultimate night/ daytime glow. What are some of yours?